Radflex FP2000 is a water resistant compressible material that can be fitted into horizontal or vertical movement joints to maintain fire compartmentation in walls and floors. 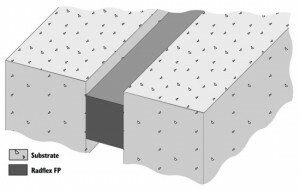 The material is inserted into the joint gap and there is no need for sealants. Radflex FP2000 is supplied in 1 metre lengths and can give a 2-4 hour fire rating. The product is unaffected by water and can be used where moisture and water ingress may occur. When Radflex FP2000 is fitted, it requires no maintenance to ensure long lasting protection. Installation and use causes no ‘health and safety at work’ hazards, provided that the manufacturers’ instructions are followed with regards to cutting and handling.